There are lots of ways that efficient office personnel management can improve your bottom line. 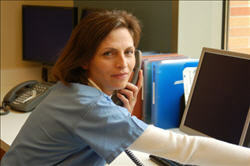 Two essential staff positions in a medical office are the receptionist and the medical biller. Let's take a look at the tasks they perform, and how office procedures and the use of technological tools can save time and improve efficiency. Your receptionist represents your practice. Pay enough to hire a good one. Everyone wants a receptionist with a good personality that their patients will like. Most providers don't want to pay a lot for someone that simply answers the phone and makes appointments. It doesn't require a strong skill set. However, unless your phone rings off the hook all day, your receptionist can and should do more than answer phones and confirm appointments. Good computer skills and the ability to multi-task are essential. There are lots of other tasks your receptionist should be able to do like filing, checking eligibility, obtaining authorizations, etc. At a minimum, the receptionist should be cross trained as a back up when needed. The other MOST important quality of a receptionist is assertiveness which leads to my next tip. Collect copays at the time of service. It never ceases to amaze me how often this doesn't happen. It is not uncommon for a receptionist to feel uncomfortable about asking for money. Most people do. It can be difficult dealing with patients who always seem to leave their checkbooks or ATM cards at home. This is where the assertiveness of the receptionist counts. Be sure to keep this important skill in mind when interviewing a receptionist for a position with your practice. Insurance eligibility and benefits should be check for all new patients. If time allows, your receptionist can check for eligibility and benefits online for most insurance carriers. Unfortunately, for some specialties, you cannot rely on websites because the benefit information is not detailed enough, in which case, a phone call will be necessary. Naturally, in high volume practices, the receptionist handles phone calls and there are other staff members devoted to checking eligibility and obtaining authorizations. However, it is always a good idea to at least cross train the receptionist to handle looking up eligibility online because this can be done while taking calls. Utilize an EHR system that includes a messaging feature or use a web messaging service like Relay Health. Inter-office messaging cuts down on phone calls so it saves the practice time and money AND frees up the receptionist to do other things. Messages can be checked periodically throughout the day which enables staff to manage their time better and not lose track of items to be completed. Giving up hand written notes takes practice but you'll find that once you embrace these automated features, you'll appreciate the time savings and efficiency they offer. Good office personnel management must include the medical biller. Naturally, if you hire a salaried medical biller, you have more control than if you outsource your billing. Follow these tips to make your biller as efficient and successful as possible. Automate medical billing processes wherever possible. It never ceases to amaze me how many medical practices do tasks manually that could be automated. There are three medical billing processes that every practice should at least look at automating. Almost every practice that bills insurance can take advantage of electronic billing. You can pay on a per claim basis or, in some cases, pay nothing at all. If you have to pay to send claims, it is still cheaper than forms, stamps, envelopes, and staff time. Don't let computer phobia stop you. It is not that hard once you learn how to do it. This automation feature is probably one of the best office personnel management tools around and it is not used enough. Electronic Remittance Advice or ERA is an electronic file version of your paper insurance EOB. You can download an ERA file into your medical billing software and post the insurance payments and adjustments automatically. What's so great about it? It saves you time to do the one thing you can't automate, insurance and patient collections. The point is, medical billing is laborious enough so you should automate everything you can. Medical billers will sometimes tell me they are afraid of using ERA. But once you try it, you'll never go back. Another office personnel management item is electronic statements. Most medical billers like to print statements so they can review them and hand write notes to the patients. However, this is not particularly efficient and most software will automate this process. Additionally, a nice feature of electronic statements is that you have an electronic record of the statements you've sent. When a patient calls with a question, you can view the statement they received. Naturally, this type of service is most cost effective if you send 75 or more statements per month. Before signing up for an electronic statement service, it's best to calculate the cost per statement to see if it is worth it. This is an office personnel management tip not to be ignored. I've mentioned this in other articles and it can't be emphasized enough. Look at your monthly financial and aging reports closely. What percentage of the total A/R is in the 90-120 day column? Look at the percentage of charges to payments. It should stay pretty consistent unless your insurance mix or contracts have changed. If you don't pay attention to the financial health of your practice, your medical biller may not either. Invest in staff software training. This is one area of office personnel management that gets short shrift. Software is seldom used to it's full capability. I see this in practices all the time. Simple things like adding notes to statements doesn't get done because of lack of training. Make the investment. It will pay off. I encourage you to implement some of these office personnel management strategies in your own practice. They will save your staff time and improve your bottom line.